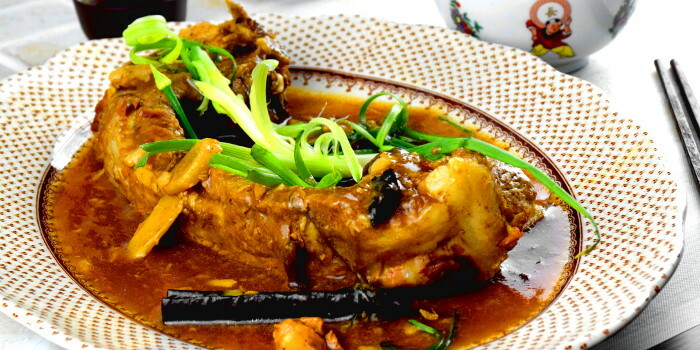 Look at the image above, the Chinese Spare Ribs that has to be tasted to believe. If you regularly use herbs and spices like rosemary, thyme, black pepper and olive oil to make braised pork ribs, now think of replacing them with a plethora of Asian spices- cloves, scallion, star anise, cinnamon, sesame oil and soybean paste. This Chinese Spare Ribs recipe is my favorite because the preparation is incredibly simple. Even though the braised spare ribs takes 3 hours to cook, it is mostly passive cooking, means you just let it braise without doing a thing. In fact, you need less than 15 minutes to prepare everything. You will be pleasantly surprised by the aromatic flavor as the result of the interplay of this oriental spices. This Chinese Spare Ribs Recipe (香燜一支骨) has a set of flavor with universal appeal that accessible to almost every palate. If you can’t imagine how these Chinese pork ribs taste like, let’s cook up a storm by following this step-by-step guide. You will be amazed how tasty it is. Note: This post may contain affiliate links. Please read my disclosure for more info. I may receive commissions for purchases made through links in this post. This Chinese Spare Ribs that has to be tasted to be believed! Let’s take a look how to prepare this amazing dish in four simple steps. Step 1- Blanch the pork ribs. Prepare a pot of boiling water. Place the pork ribs in a saucepan or skillet, and make sure the amount of water is sufficient to submerge the entire rib. I use a wok since I do not have a skillet large enough for the ribs. Bring the water to a boil. Wait for five minutes and then remove the ribs and drain. OK. We are supposed to braise the pork ribs, not blanching it in water, right? Blanching the pork rib is an essential pre-treatment before proceeding to braise. 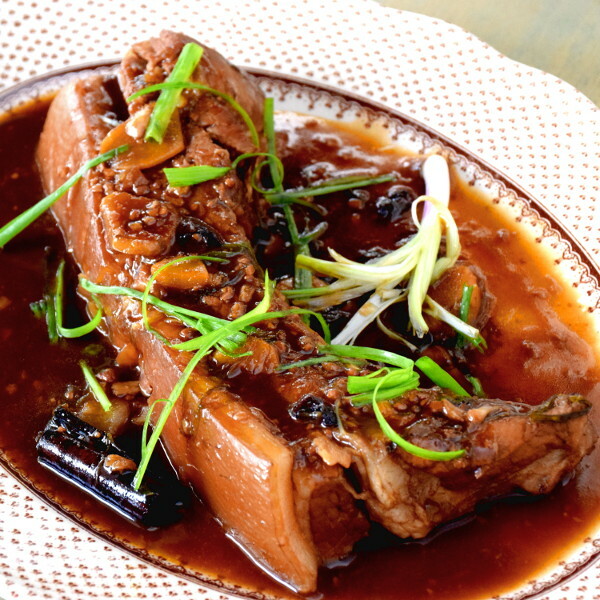 Some pork ribs may have a strong gamey taste, and blanching can effectively remove the unpleasant taste of the pork. This process will not reduce the flavor since it takes only five minutes. Step 2- Prepare the braising liquid. The herbs, spices, and seasonings in the braising liquid define the complex and yet subtle flavor of the pork rib. This step begins with adding two tablespoons of vegetable oil to the wok over medium heat. Put your palm about two inches above the surface of the oil. If you can fill the heat from the oil, it is now hot enough to saute the herbs and spices. Then add five slices of ginger, three cloves of garlic, two stalks of scallion, one star anise of about seven to ten star-points, and one stick of cinnamon, about 5 cm length. Saute the spices slowly over low heat until they turn aromatic. Next, add 2 tablespoons of fermented soybean paste, 2 tablespoons of light soy sauce, 4 teaspoons of oyster sauce, 2 teaspoons of sugar, 1 teaspoon of sesame oil, 4 tablespoons of Shaoxing wine, and lastly 1500 ml of water. Stir and mix well the liquid and wait until it is boiling. Do you realize that there is no salt in the recipe? The soybean paste, light soy sauce, and oyster sauce all contain salt, which will provide sufficient saltiness to the recipe. Bear in mind that the amount of salt in different brands of soybean paste, light soy sauce, and oyster sauce are not the same. Therefore, I always like to adjust the saltiness of the sauce right before serving. If you follow this recipe, the saltiness is joust right in most cases. But you can add additional salt and light soy sauce during the final adjustment of the flavor. And now you have completed most of the work. Just place the spare rib in the skillet (or wok in my case) and start braising it over low heat with the lid on. Now sit back and relax. Have your coffee break or pick up a storybook. All you need is to check the progress of the braise occasionally. There are two common questions about braising. First, should I close the lid or leave it open? And the second question, how long should I braise the rib? 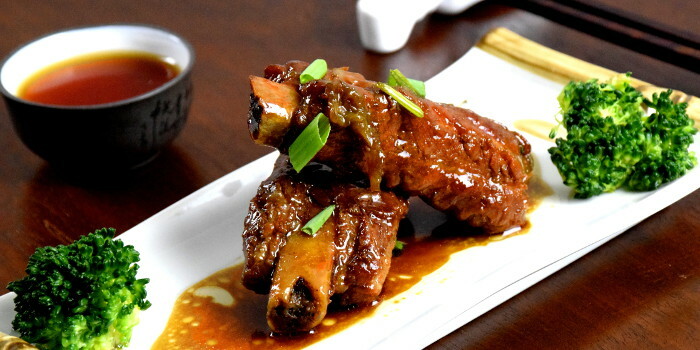 Here are a few tips to help you make sure that you get the flawless Chinese Spare Ribs. You can either leave the lid on or otherwise. If you cook without the lid, please monitor the level of water in the skillet regularly, as it will dry out pretty fast. The advantage of putting the lid on is that you do not need to check the amount of liquid often. Always use the lowest heat to cook. You can raise up the skillet a little by putting a steaming rack on top of the stove and place the skillet on it. Bear in mind that you are braising the rib for three hours. The meat will eventually be so soft that it just falls off from the bone. Since the rib is only partially submerged in the liquid, it is best to turn the spare ribs over occasionally to ensure even cooking. The actual duration of braising depends on the heat and whether it is covered. Generally, it takes about three hours, but you can stop short once the meat is tender and soft. After three hours of braising, there is only one more step remain before serving – to make the umami-rich sauce to coat the pork ribs. Check the amount of the braising liquid. If it is too dry, add a bit of water and bring it to a boil again. Then add some cornstarch slurry to thicken the liquid to form a thick sauce. Sometimes the liquid is already thick enough as the result of the gelatin from the bone. In this case, you can just omit the cornstarch slurry. The goal is to form a thick sauce that will cling to the rib, that for sure will tantalize your taste buds. Remove the spare rib from the saucepan, place it on a large plate. Pour the thick sauce over the rib. Garnish with scallion. Serve. This recipe is easy to prepare. You can adjust the amount of each ingredient according to your preference, and it will still turn out to be outstanding. You can follow this recipe for the first time and make changes during your next attempt. 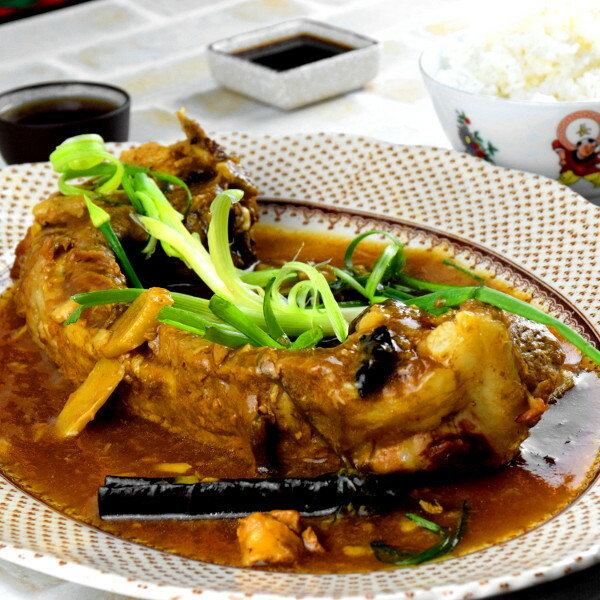 Chinese Spare Ribs are best to serve with steamed white rice along with some leafy vegetable. Guarantee to make your belly rumbles! Now it is your turn to cook. Leave your comments and questions below, and I’ll try to reply as soon as possible. A picture worth thousand words, a video worth thousand images. 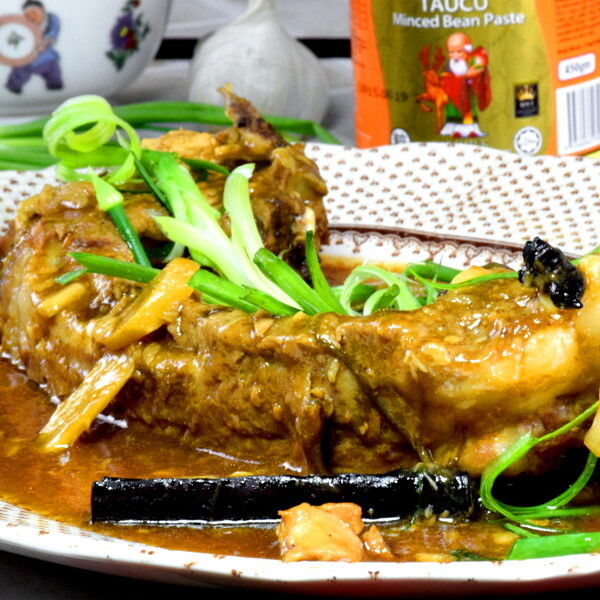 A delicious Chinese style braised pork ribs that only take fifteen minutes to prepare. Place the pork rib in a large skillet with boiling water, which is sufficient to cover the entire pork rib. Blanch for 5 minutes. Remove the pork rib and discard the water. Heat up the vegetable oil in a wok or saucepan, saute the ingredients in B until aromatic. Add ingredients C. Bring it to a boil. Place the spare rib in the boiling liquid. Reduce the heat and braise for 3 hours. Turn over the spare rib occasionally. After 3 hours, add the cornflour and water in INgredients A to thicken the braised liquid. Remove the spare ribs and place it on a serving plate. Pour the thickened sauce over the spare rib. Get The Best Asian Recipes Free! Learn how to cook the time-tested recipes served in an Asian restaurant created by a native Asian chef. 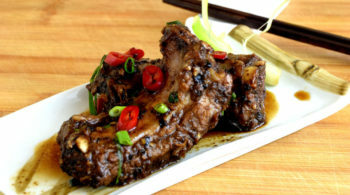 11 replies to "Chinese Spare Ribs Recipe – How to make in 4 simple steps"
Hi, this is KP Kwan. I am happy to see you in this comment area, as you have read through my recipe. I am glad to reply any questions and comments as soon as possible. Hello..This sounds delicious! I was wondering if I could use the same ingredients and technique using a boneless pork roast instead of spareribs.? It is OK to use boneless pork to replace the ribs. The only small difference is that the bone enhances the flavor of the gravy (during stewing), although it is not significant. The preparation is easy, and most of the cooking time is just let it braise. Hope you will enjoy the Chinese spare ribs. This looks really good. It looks like it will just melt in your mouth. I like how you used the spare ribs with the skin and fat still attached to it. Glad you like the Chinese spare ribs recipe. Please try it, and you will love it. At what point do you divide up the rack into individual ribs? This is the sparerib (one large long bone with meat attached). It is not like lamb racks. We normally serve the whole long bone on the large plate and share with everyone. That’s how Asians are sharing the food. If you want to divide it into individual portions , you have to cut the bone into sections after it is cooked. I have not served this way so far though. ©2018 Taste of Asian Food. All Rights Reserved.